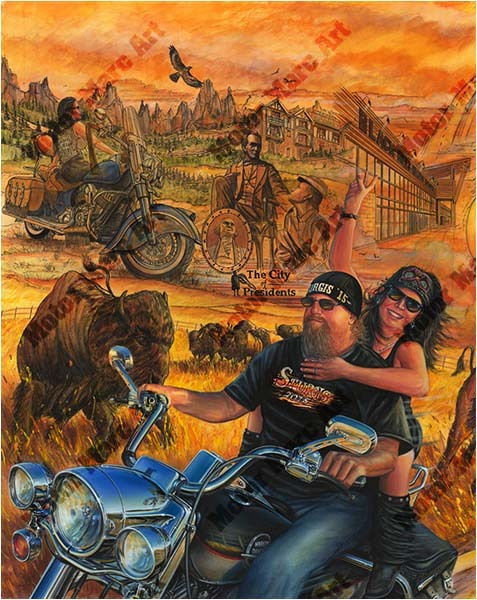 Media Size Choose an option18" x 24"24" x 30"32" x 40"
Congratulations to Sturgis 70th rally. Soaring like an eagle, while grasping the road under their grip. 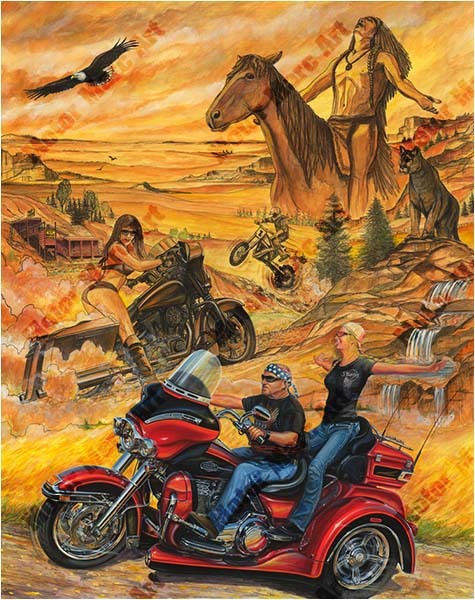 We welcome legend riders with their V-twins as they thunder into the western South Dakota where sky-piercing granite peaks and forested mountains dominate. Riding and touring the epic sculpture of Mt. Rushmore, which stands as a shrine of democracy and symbolizes the greatness of this nation, to the scenic Iron Mountain Roads into the roaming buffalo fields of Custer State Park. 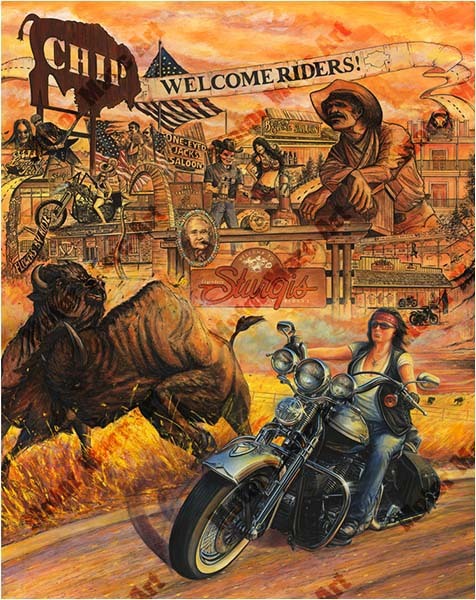 Along this journey, riders will find wildlife, pigtail bridges, magnificent Black Hills scenery and tunnels that frame the legendary mountains with its genuine story tales . 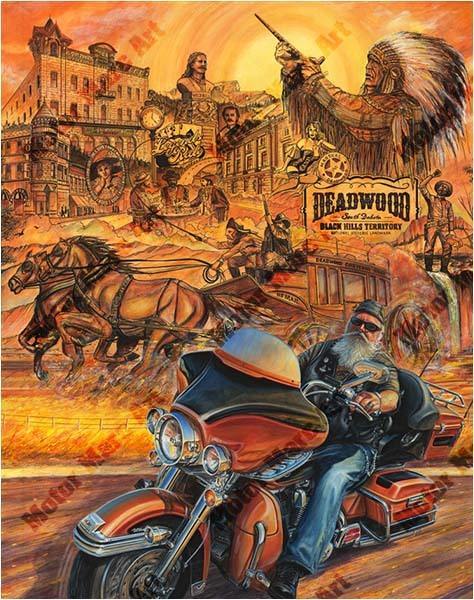 The golden grasses lead them to gold mining legends and to Deadwood where legendary stories became true. The beauty of Sylvan Lake nestled in the Needles is the next stop. Following on to Crazy Horse Memorial which honors the culture, tradition and living heritage of North American Indians. 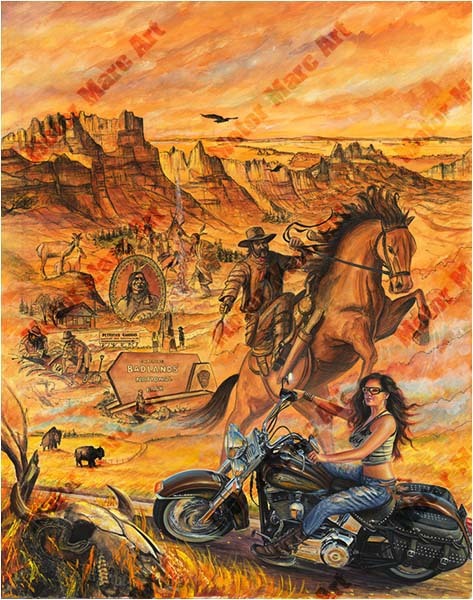 The day concludes with a step back in time with 1880 train rails gliding over the rugged landscape, then off to the Bad Lands before the howling wolfs wake up the dinosaur museums at night fall… Legend rider is Motor Marc’s commemorative painting for this year’s rally. 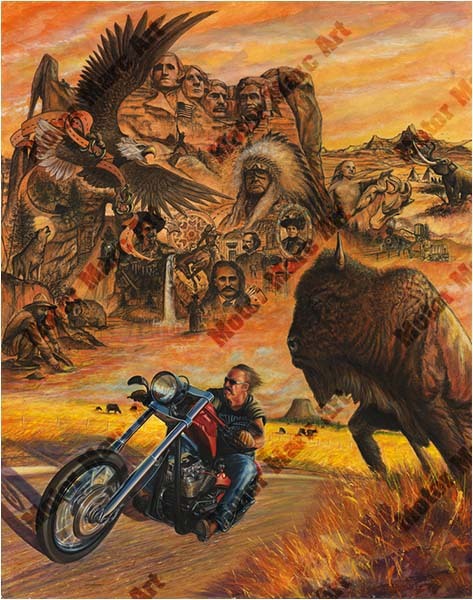 “Motor” Marc again connects the strength of the legendary lands with the power of iron horses rider. This limited edition work-of-art will impress the true legend rider motorcycle enthusiast with an era gone by.